If you've been on the blog in the last few days, you will notice there's been a change .... well, after almost five years of the same look, I decided it was time to switch things up. I've been thinking about this for a while now - probably almost a year - but I kept on going back and forth on how to go about it: stay on blogger vs. archive blogger and move to a different platform; stick with blogpsot.co.uk vs. switch to .com or .co.uk; hire a designer to help redesign the website vs. learn to code; old logo vs. new logo, and so on. Over the last six months, I also spoke to different people - asking advice on all of these questions I had. After thinking way too much, I finally decided that I would redesign and change my logo and switch to .com or .co.uk. What I wasn't quite sure about was how I felt about getting an entirely new website, and saying bye to blogspot. One suggestion was to write a post saying I am no longer on this platform and here's a link to my new home. Honestly, I was still undecided when Friday morning I woke up super early and couldn't go back to sleep. My initial plan was to wait until December to redesign the blog and launch a new look bookshy to celebrate 5 years of blogging. But, in my 'I-still-have-way-too-many-hours-before-I-need-to-start-work-and-I-can't-go-back-to-sleep' state, I decided to finally look into moving from .blogspot.com to .com or .co.uk. This wasn't as difficult as I imagined, thanks in huge part to google. Thank you google! Now I had a new address, and with still way too many hours before I had to start thinking about work, I decided to look into templates for blogger. I searched and I searched, and searched and searched and searched some more. The idea was that if I really could not find one template that I liked, then I would look into a web designer. I had already started taking an online course on how to code as I had decided that as a last resort I would do some basic redesigning of bookshy myself, but I would still need someone skilled to do the major work. Thankfully, I found a few templates I liked. Now it was time to think about work, so I saved the templates and figured that I, at least, had something to work with for December. Oh, how wrong I was! After work on Friday, I decided to play around with these new templates and see what worked. I had already backed up my old template, but I won't lie, I was nervous! What if in trying things out, I ended up mistakenly deleting something and losing it all. Thankfully that didn't happen. And so over the next two days - mostly Friday evening, but also Saturday - I modified the template I downloaded (again thank you Google and YouTube) - shared screenshots with friends and family asking for their thoughts, and started bringing together the thoughts I had from almost a year of thinking and speaking with people for the new look bookshy. With the new look comes a new logo. There were many iterations and options of logos, and this also went through a process of sharing with a few friends and family to get their thoughts before deciding on the final one, which was unanimous - and enables me to play around with colours (if I need to). I have to say a major, major thank you to West Port Five - a young, design consultancy based in London - who designed the new logo. For keeping the essence of the old one (which I really did't want to lose - I wanted the glasses and the eyes to remain) but also capturing my geeky and inquisitive nature when it comes to African literature - which is what this blog is all about. When I think about the new logo, it is also going a step further by showing that I have in a way stepped away from peeking over the books over the last almost five years. Something, I have to say I am still coming to terms with. I am still working on the site - tweaking and re-tweaking a few things here and there - and really making sure the formatting of the older posts work with the new template. 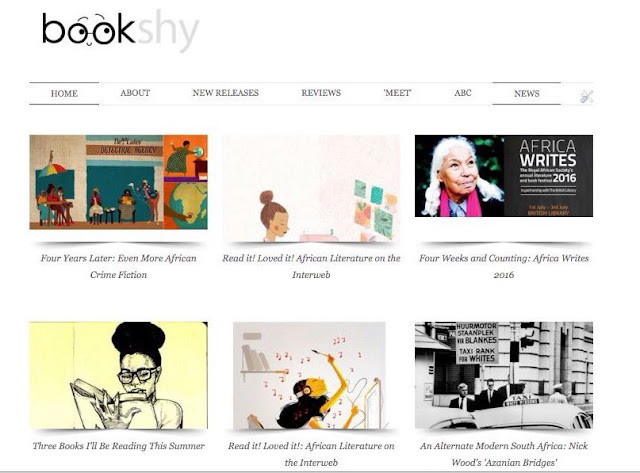 I also know that it often takes time to adjust to new things - I know I found it hard saying bye to the old logo and old design, but I do hope you join me in this new look and hopefully new chapter as I continue to celebrate and geek out on all things African Literature. Lovely logo. Congrats on the new look. Onwards and upwards. New design is looking wonderful. Been away for too long but I am glad I came back to this new look! I lurve it! Yay! Thank you! Warms my heart to read this :).